Given a number N, find the smallest number that has same set of digits as N and is greater than N. If theres no number greater than N by same same set of digits then print -1. 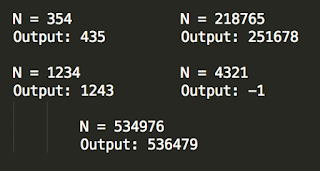 For example if N = 354 then all possible cobinations of the N digits will be 345, 435, 453, 534, 543. So the output will be 435 is the next smallest of all combinations and greater than N.
Below code a simple permutation and combination of all digits from given N and get the next number from given number. If don't find any number then return -1. For permutation and combination we use recursive algorithm and stores the combination in the TreeSet.